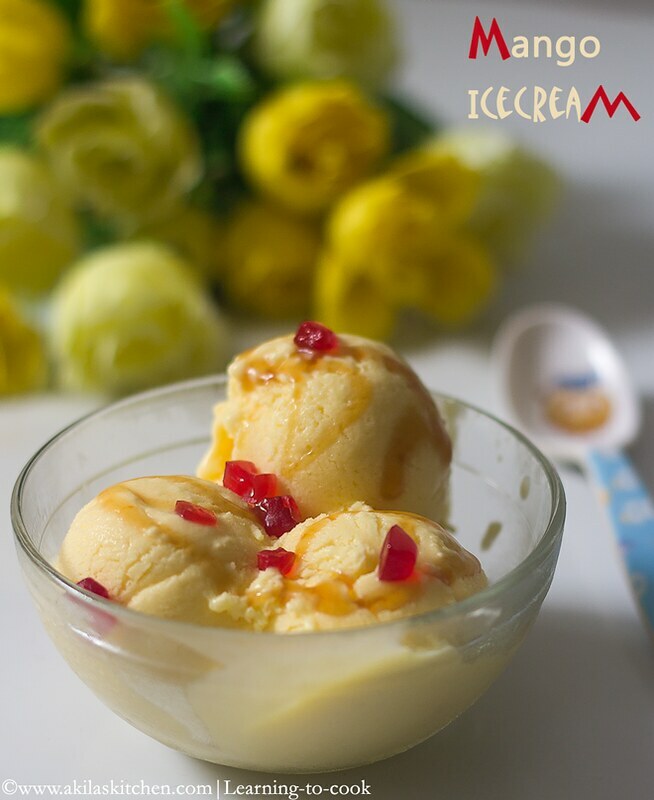 Who says no to Mangoes… That too for the ice cream… I just love this Eggless mango ice cream so much. I already have different version of mango icecream which is made using the condensed milk. But this one I tried with the same logic of this rose milk ice cream by adding the whipping cream and it turned out so good. My kid loved the icecream and asked me to add some chocochips and tutti fruitti on top of it. I added honey and had my icecream. It was super dooper hit in my family. 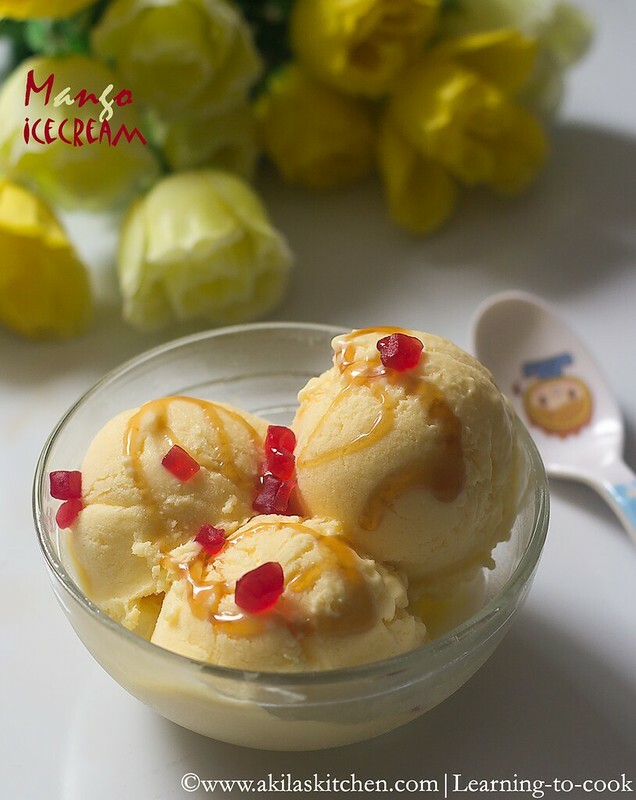 So try this at home and enjoy the hot day with this cool cool mango ice cream. 1. Take the mango, wash and get its flesh part. 2. Add the sugar, salt, milk and the mangoes in a blender and blend until you get smooth paste. 3. Use the whipping cream shown below which contains 35.1% milk fat. So that you can get the creamy texture for the ice cream. Add in a bowl along with the mango paste. 4. Blend them using electric blender in medium speed for 2 min. Check whether it has become creamy, else blend it some more time, in low speed and check the consistency in 30 sec interval. (See notes). Pour it in the freezer safe bowl and keep in freezer for 2 hrs. 5. After 2 hrs, again crush the ice cream using a fork and make it again in creamy texture. Do this process for 3 to 4 times, at regular intervals. After that Keep in freezer for 6 to 8 hrs. 6. Serve your creamy mango ice cream. 7. 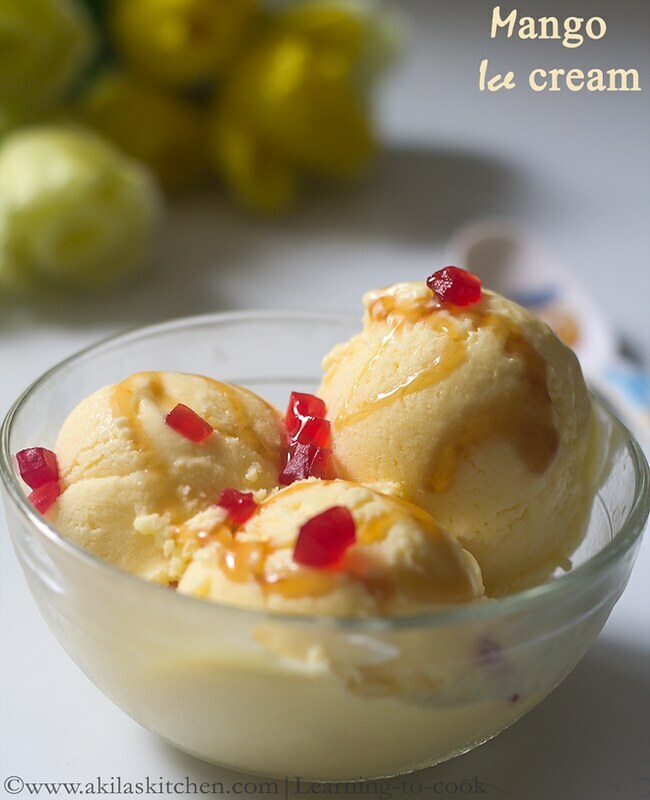 Yummy, creamy, eggless mango ice cream is ready and I served with the tutti fruitti and honey. Easy Eggless Mango Ice cream without the Ice cream maker is ready. 1. Always try to use the cream which contains 35% milk fat or more. This gives the creamy texture to the ice cream. 2. Be careful while blending the ice cream, as the whipping cream when over beated, turns to butter. So while blending, check its texture at regular intervals. 3. 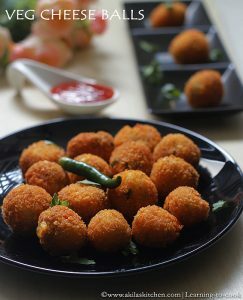 I used Thai Mangoes. You can try with any type of mangoes except the sour ones. Such a luscious icecream,love to have few scoops. its easy but looks so creamy far better than store bought. have to try this for sure. tempting and photos looks good. Wow….mango ice cream looks sooper rich n delicious…pics with tooty frooty look amazing….wonderful…btw,, what variety mango did u use for this ?